“Tell me if you think this sounds nutty, OK?” Cavillace, the mutant Draik, rolled onto her elbow to face her brother. She studied the outline of the ghost Krawk’s face in the fading light as she waited for him to respond. The Draik smiled and relaxed back down onto the spongy tufts of grass, and placing her arms behind her head, gazed back up at the evening sky, waiting for the appearance of the first stars. GM was not only her brother but also her best friend, her sounding board for as long as she could remember, and she knew she could trust him with her most private thoughts. “No, not exactly.” Cavillace felt a flush of embarrassment begin to burn in her cheeks as she continued to look straight up at the sky, avoiding GM’s penetrating stare. She often felt as though her brother could see right into her, and although she held no secrets from him, she preferred to choose when and what to share. 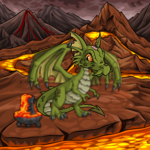 “Maybe we should just forget about this,” the Draik finally said with exasperation. GM gave a low chuckle and asked, “Are you saying that I’m not real? That I’m an ‘actor or a robot or something’?” His mocking air quotes threw off his sister’s train of thought. GitchiManitou followed the orange Grundo through the labyrinthine corridors. The unnatural green lights that glowed overhead cast everything in a sickly hue which, when coupled with the stale air that pumped through the ventilation grates, added to the Krawk’s queasiness. He hated being called up to the Space Station, but knew he could not refuse. A grey Evil Fuzzle floated past, gnashing its furry jaws at the Grundo, and GM turned his head in distaste. Soon, with a pull on a hidden lever, the Grundo opened a set of concealed doors and ushered the Krawk into a meeting pod. Before long, another set of doors whooshed apart and a cloaked figure entered. With thin, green fingers he lowered his hood and levelled an imperious glower toward the Krawk. “Dr. Sloth,” GM said curtly with a quick nod of his head. “Minion,” the other replied, stretching the word out into three syllables in a way meant to be both belittling and intimidating. He then cracked his face into a wide grin, an expression many found more frightful than his frown. Sloth’s eyes moved rapidly back and forth, seeming to scan the Krawk’s face like a laser, and afforded GM a look deep into his disturbed soul. Sloth turned away just as GM succumbed to an involuntary shiver. Dr. Sloth turned back toward the window and waved his hand emphatically at the Grundo, who then made a motion for GM to follow him out of the meeting pod. As the Krawk trailed the Grundo toward the Hangar, he had much to think about. One word, however, kept repeating itself insistently: Nutty.